Trinidad and Tobago is a republic with a population of 1.3 million people and under the People’s Partnership Government, the education sector is considered to be one of the most significant developmental tools, having received the largest budgetary allocation for the past three years – close to 18 per cent of the annual expenditure and close to 6 per cent of our GDP. As Minister of Education, I conducted a strategic assessment of the education system and then undertook its total reconfiguration, re-engineering and recalibration. Perhaps one of our greatest and most progressive policies in education to date is our E-Connect and Learn programme, which essentially entails giving all students entering their first year of secondary education a free laptop, necessary paraphernalia and access to the internet. Our first female Prime Minister, the Honourable Kamla Persad Bissessar, had announced this policy of free laptops for all secondary school children during our election campaign as a means of improving the education system and socio-economic status of our citizens. The systematic approach to improving access to the internet is also geared at ensuring that families in all areas of Trinidad and Tobago, especially the rural areas, have access to the internet and the wide berth of knowledge and resources it brings, since the laptops are by extension used not only by the students but by each family member in the student’s household. Preliminary assessments show that the programme has already begun to impact on alleviating the illiteracy rates of parents and grandparents (given the propensity for nuclear type living arrangements in Trinidad and Tobago), as well as allowed people in these families to become computer-literate and in the process, empower them, teaching them how to access information on issues crucial to them – health, basic education and their rights as citizens. Thus far, with our laptop initiative we have now given out close to 55,000 laptops to our students, almost 4,000 to our teachers, and by the end of our first five-year term in office we would have given out close to 88,000 laptops to our students from forms one to five. In fact, in the first year when we gave the laptops, we rose 16 per cent in the global index. We have also focused on achieving free universal early childhood care and education by 2015. Currently, there are 34,000 children between the ages of three and five in Trinidad and Tobago. At present we have 170 ECCE centres, with approximately 8,000 students. In the past three years we have completed 51 ECCE centres with another 26 centres earmarked for completion by July 2013. This means that for the beginning of the new academic year in September 2013, we would have constructed nearly 80 childhood education schools. We have also invited 200 existing private preschools to partner with the government and we have now developed four models where we do so, which entails the government financing the cost of their students and teachers. We have further focused on special needs children, since 30 per cent of our students have some special needs, whether it is dyslexia, autism, emotional, behavioral or psychological abnormality, deficiency in reading and hearing or neurological problems. – so that we would have educational psychologists, behavioral psychologists and clinical psychologists looking after these children and looking after their learning abilities. improving literacy, numeracy and overall academic performance; increased teacher training; curriculum reform; organisational restructuring and institutional strengthening; and improved infrastructure. These are but a few of the many measures we are undertaking at the Ministry of Education in Trinidad and Tobago to make our country a truly developed, progressive and democratic nation. The government is engaged in implementing a new economic strategy that incorporates the National Innovation System, which promotes economic diversification and aims to increase research and development spending to at least three per cent of GDP over a ten-year period. The main pillars of the strategy include information and communication technology. There are six years of compulsory education starting at the age of six. Primary school comprises seven years and secondary five, with cycles of three and two years. Some 89 per cent of pupils complete primary school (2009). The school year starts in September. Tertiary institutions include the St Augustine campus of the regional University of the West Indies (UWI), which also has main campuses in Barbados and Jamaica. At St Augustine, UWI offers undergraduate and postgraduate courses in agriculture, education, engineering, humanities, law (the Hugh Wooding Law School), medical sciences, sciences and social sciences. 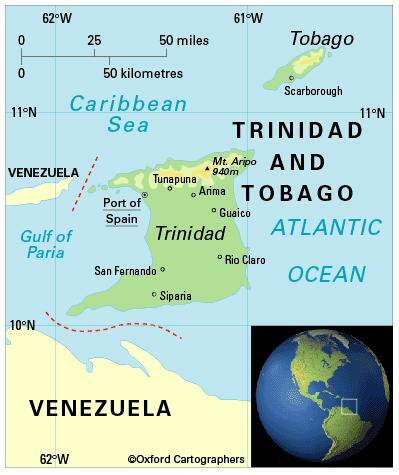 The University of Trinidad and Tobago was established in 2004 and includes the Eastern Caribbean Institute of Agriculture and Forestry. Other tertiary institutions include the College of Science, Technology and Applied Arts; and Polytechnic Institute, which provides adult education in the evenings and shares premises with the Sixth Form Government School. There is virtually no illiteracy among people aged 15-24.